Easily calculate GST, VAT, CT for any amount! Totally free!! 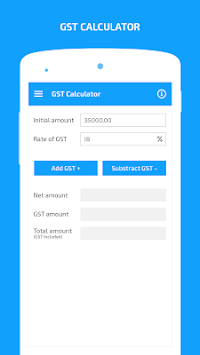 GST Calculator is designed to calculate the inclusive of sales tax, exclusive of sales tax and the tax value for a given amount while allowing you to specify the tax percentage you want to use. This allows you to customise the values for any country or situation. 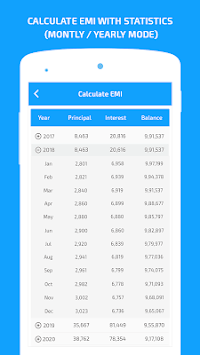 Now you can calculate Loan EMI, SIP And GST calculation tool that helps user to quickly calculate EMI, Load Amount, Interest Rate, Load Period, SIP, GST and view payment schedule. 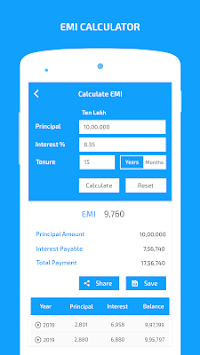 Use this app to calculate your EMI (Equated Monthly Instalment), plan your loan repayment in effective way. HSN- Harmonized System of Nomenclature, which is internationally accepted product coding system used to maintain uniformity in classification of goods under the GST regime. - Share the calculation by Email, Twitter, Facebook, Instagram, WhatsApp and any other social media. ● Finance Calculator is the special kind of calculator that calculates your Loan EMI. ● SIP Calculation and Planing. ● GST Calculator- Tax included & excluded calculator. ● GST Calculator for all country with GST Tax Rates. Add or reduce GST from amount. ● Representation of payment split up in the table form. ● Graphical representation of complete tenure of Loan. ● Calculate EMI on monthly basis. ● Generate statistics chart instantly. ● Statistics shows Principal Amount, Interest rate and remaining balance per month. ● Save Loan profile and get notification before installment time.